Ever wondered what would be found in my stomach after an Esophagogastroduodenoscopy? Yeah, I thought so! 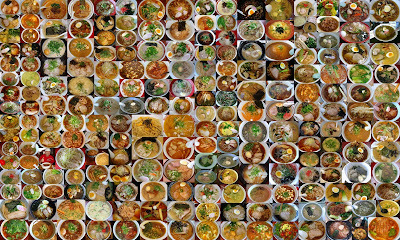 That's precisely why I put together this collage of all the ramen ever slurped on this blog. It's well over 200 pics in a span of 19 months and if I do the math correctly, that's roughly 2.5 bowls per week (without including all the instant ramen or repeat visits that I never bothered to post). Aaaah a life without ramen...is no life at all! Are you hungry now? Cause I am! Think you can name where each ramen came from? Don't worry, I probably can't either. @kelvlam: Thanks! The ramen diet sounds like a great idea...haha. Amazing picture ! so yummy !! @t3peace: Thanks! Or should I say Merci!